This distinctive spring wildflower often forms dense patches of colour in sheded boggy places and on disturbed roadside verges. The flowers appear before the leaves, and as summer approaches the flowers decay while the leaves continue to grow bigger, eventually looking rather like rhubarb. Fowering spikes emerge from the ground in March before the leaves appear, and the flowers persist through April and often well in to May. The toothed, heart-shaped leaves usually emerge in early May and continue growing until late summer, by which time they can be up to a metre across. Although matt or felt-like and mid green on their upper surfaces, the leaves have light-grey and distinctly hairy undersides. 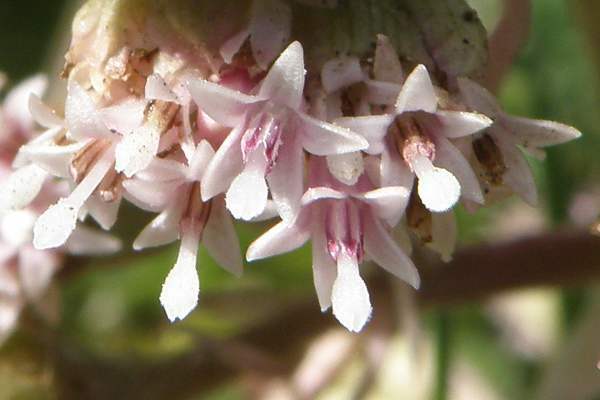 Male and female flowers occur on separate plants (so this is a dioecious species, literally meaning having two houses'); however, in Britain it seems that male plants are quite a rarity. Female inflorescences can be up to 70cm tall, while male plants are reported to be much shorter and more squat on average and with more densely-packed flowerheads. Each floret comprises typically 15 to 25 individual five-petalled pink flowers. Most often seen in damp, shaded places such as wet meadows, damp woodlands, stream banks and ditches, Butterbur is particularly conspicuous when it colonises disturbed roadside verges and waste land. 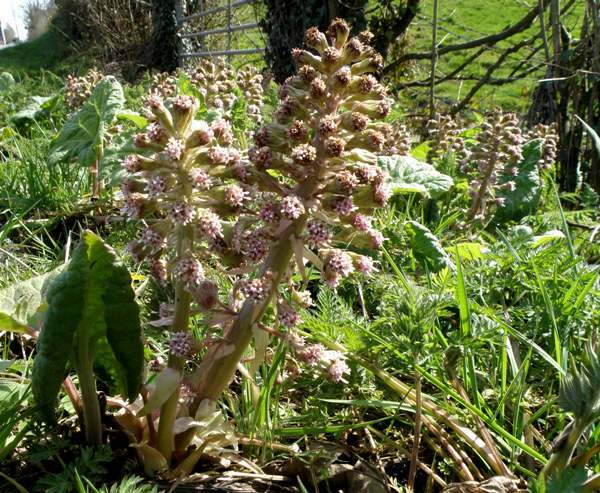 In Britain and Ireland Butterbur produces its flowers from March to May. This member of the asteraceae family of flowers is also sometimes referred to as Bog Rhubarb. An introduced species, Petasites albidus, is very similar but has white flowers. Another, earlier-blooming wildflower with which Butterbur is sometimes confused is Winter Heliotrope, Petasites fragrans; as its scientific name suggests, this is a scented flower, whereas Butterbur has no discernible scent. The other obvious difference is that there are far fewer flowers on the lax spikes of Winter Heliotrope, whose leaves are much smaller than those of Butterbur. 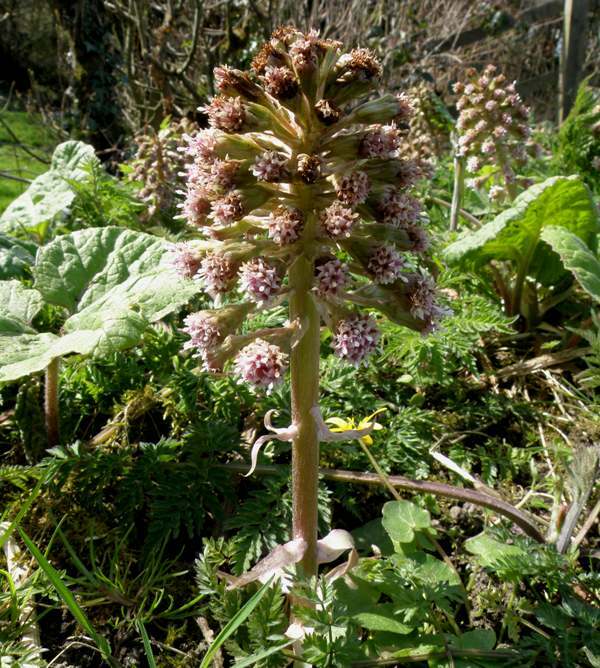 The Butterbur specimens shown on this page were photographed in Wales during May.